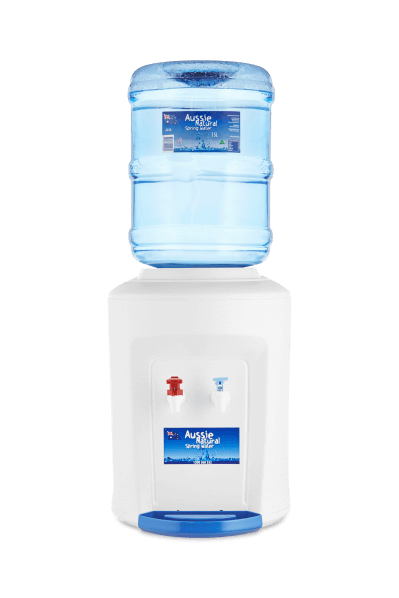 Our Hot ‘n Cold Benchtop Water Cooler Dispenser is the pinnacle of convenient, instant refreshment. From icy cold to quench your thirst to instant hot for that quick cup of coffee, tea or soup. It’s like having you own oasis of refreshment conveniently located in your home or office. Do you need a benchtop solution, to provide your friends, family, or colleagues with fresh water? Our Aussie Natural Spring Water benchtop water coolers are the perfect way for you to provide our great tasting spring water, in a compact space. For a refreshing glass of chilled spring water, or a hot cup of tea, coffee, or soup- no matter the season, occasion, or space, our benchtop water cooler can offer you a convenient solution. Available for sale, and with delivery options for our Perth and West Australian customers, get spring water delivered right to your doorstep. Experience fresh, crisp water -hot or cold, in an instant. This is perfect for at home; cooking, preparing food, tea, coffee and other hot beverages; or icy-cold drinking water for ultimate hydration.